One of the ‘seven sacred cities of India’, Kanchipuram, also known as Kanchi, is regarded as the golden city of a thousand temples. Being the only city sacred to both Shaivites (Shiva worshippers) and Vaishnavas (devotees of Vishnu), it continues to dazzle the visitors with its transcendental temples with their sculptures and architectural beauty. Kanchipuram city in Tamil Nadu is different from any other in South India because of the large number of Gopurams (temple spires) which soar into the skyline. The city is also famous for the vast number of looms which spin out priceless Kanchipuram silk and gold sarees, counted among the finest textiles of India. 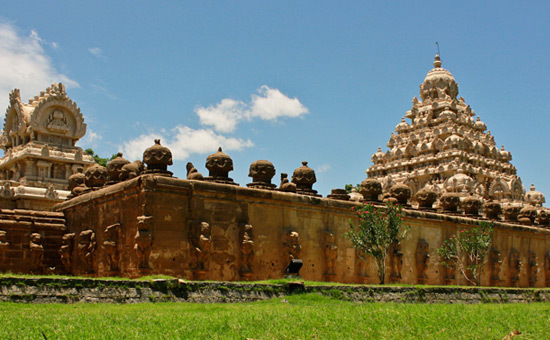 Both the temples and silk have Kanchipuram on the tourism map of India, counting it as one of the points of the golden triangle comprising Chennai, Kanchi and Mahabalipuram for tourism in the state of Tamil Nadu. The era of lofty towers, glorious Mandapams and the many pillared halls in Kanchi was initiated by the great king Krishna Deva Raya of the golden age of the Hindu empire of Vijayanagar. 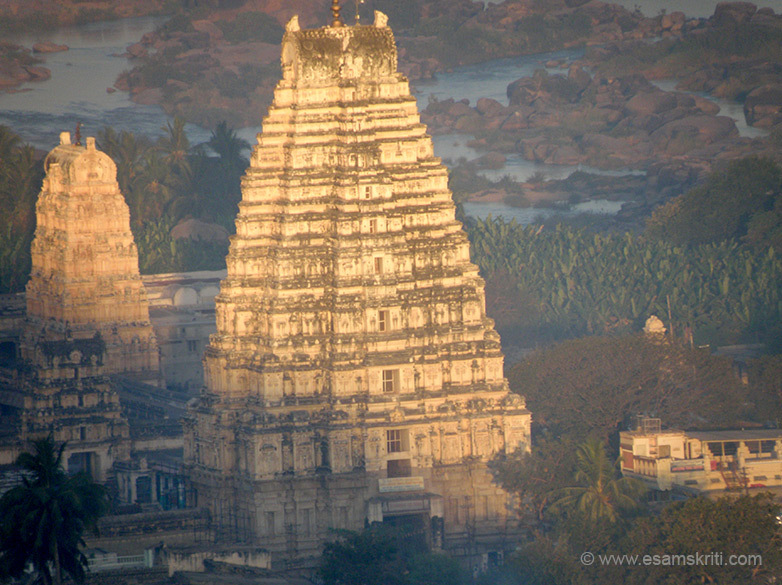 The oldest of the temples in Kanchi, built of reddish sandstone, is the Kailasanath temple in western Shiva Kanchi. It has inlays of sculptures depicting the legends of Shiva, figures of a smiling Parvati, motifs of Nandi or the sacred bull of Shiva and yalis or gargoyles and lions. Particularly noteworthy is the wall which surrounds the rectangular sanctuary of the temple. It has a row of 58 small shrines in the area, each one as beautiful as the other with a Nandi seated in front of the Shiva linga. Another feature of this temple is that the outer walls have shrines with Gopurams at every corner and at the centre of each wall. Each shrine is topped with a dome. East of the main temple is a columned Mandapam and further east is the great temple. About two kilometres south east from the Kailasanath temple is the second oldest temple in Kanchi, the Vaikunta Perumal temple. It is particularly renowned for its typical Vimana, the tower over the sanctum which rises in three diminishing tiers with a figure of Vishnu in each in a standing, sitting and sleeping positions. Almost diagonally across is the Kamakshiamman temple. 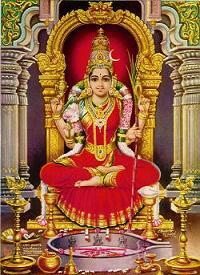 It is dedicated to Parvati, ‘the goddess with the eyes of love’. The shrine is crowned by a guilded Vimana. Its four Gopurams are different in elevation and decoration. But the shrine’s columned Mandapam is richly carved. Friezes along the base and beautifully adorned pillars, plasters and brackets make it the best visual feature of the temple. 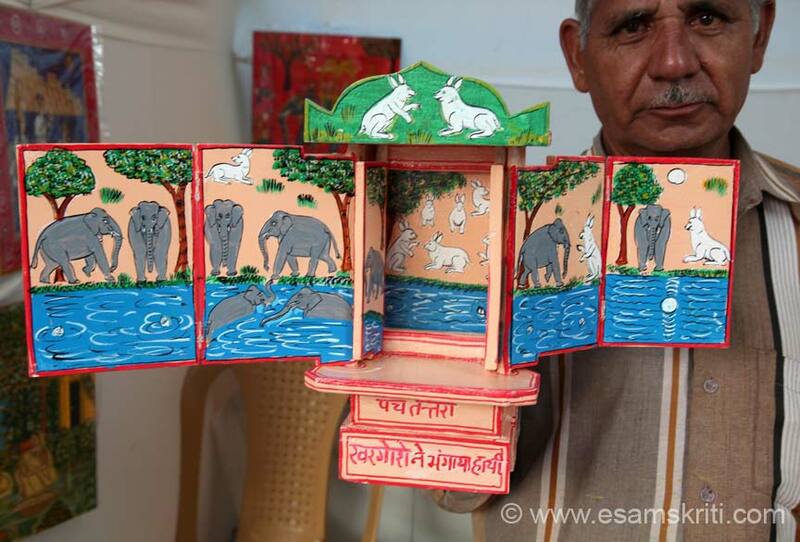 Another striking feature is the intricately sculpted wooden temple chariot parked on the street outside the temple. 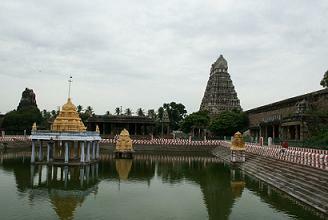 If one enters Kanchi from Chennai, it is the Ekambareshwara temple which draws the visitor’s eye first. The tallest and most impressive in South India, rising to a height of 58 metres, it stands on a two storey base in eight diminishing storeys and is crowned with richly ornamented vaulted roofs. On this Rajagopuram (royal spire) are carved several figures of the emperor and his consorts. The outstanding feature of the temple is its 1000-pillared hall which is very impressive with intricate carvings on the pillars. Also present at the opposite end of the town is Vishnu Kanchi, which houses the most important shrine of Vishnu, called here by the name Varadarajaswami. Constructed on the Hastigiri hills, it is believed that this temple commemorates the yagnya or ritual sacrifice performed by Brahma to seek Vishnu’s presence. Huge in size, the idol stands tall in the sanctum, well adorned with jewellery. In his four hands, Vishnu holds the symbols he is associated with - i.e. conch, the Sudarshan wheel, the mace and the lotus. The conch is a call to listen to one’s inner voice. 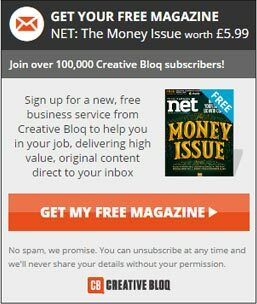 The wheel is the symbol of the destruction of all evil. The mace is to awaken those who are lost in the darkness of ignorance and the lotus is for peace within and without. 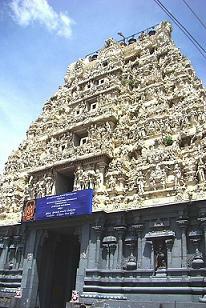 Entrance to the temple is through the eastern and western Gopurams of the temple. 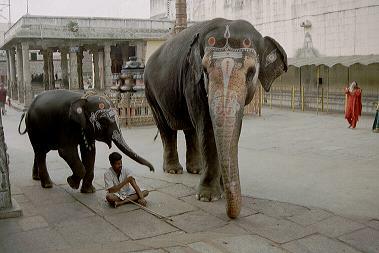 What also catches the attention of the visitor is the 100 pillared Mandapam by the west Gopuram. 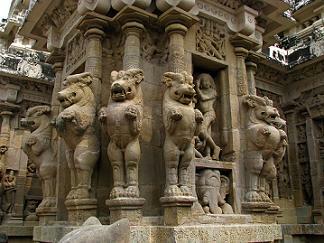 Each pillar here is marvellously hewn and enriched with warriors, horsemen, swans and other traditional temple motifs. But the most splendid creation here are the ornamental chains of inter-connected rings sculpted from one rock. 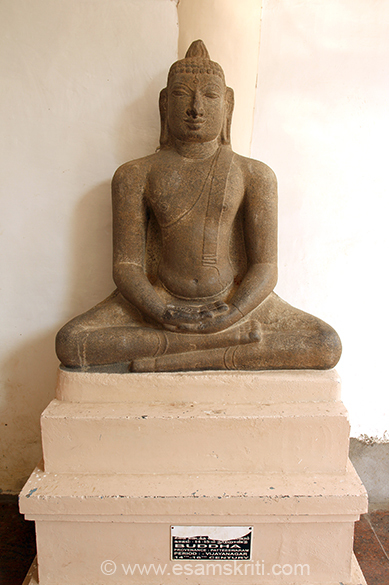 Last but surely not the least, is the Jain Kanchi in Tiruparuthi Kundaram, lying south west of Kanchi. Once a Buddhist and Jain centre, today this complex has only the Vardhamana temple. In front of the two shrines which constitute the temple is a long, pillared Mandapam whose ceiling is rich with gorgeous paintings of the lives of Jain Tirthankaras as well as the life of Krishna. Moreover, in spite of the number of temples and Gopurams and tanks, more people visit Kanchi to seek blessings of the Acharyas of the Kamakoti Mutt and the Kanchi Sankaracharya who resides in this city. Beyond the physical beauty of this temple city, Kanchi is a city of everlasting faith and a destination for those who search the wisdom of past ages and the spiritual enlightenment offered by those who created the wonderful shrines. The nearest city for visitors to Kanchi is Chennai, the distance being only 70 kilometres.